Marks & Spencer is taking action to prevent plastic waste from going to landfill with the launch of a new initiative, which will enable customers to bring back non-recyclable plastic packaging and see it transformed into shop fittings and playground equipment. 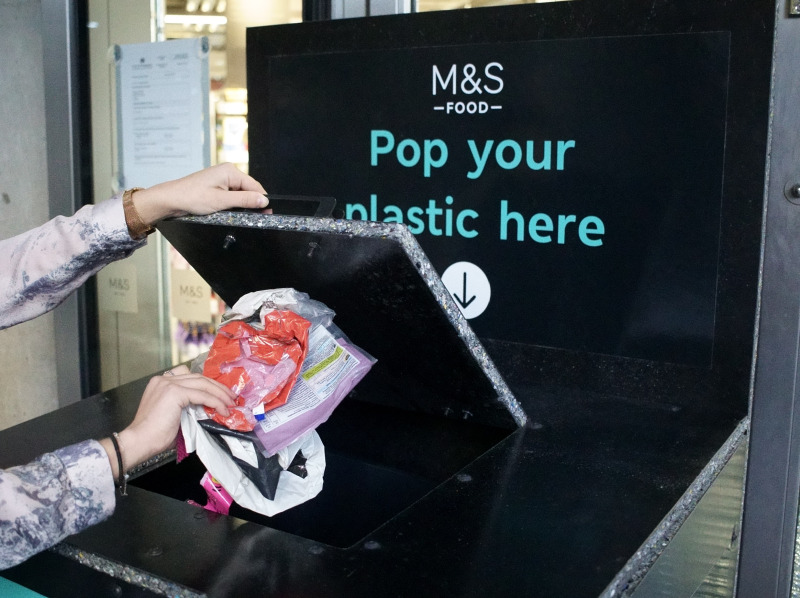 Customers can drop a variety of plastic packaging in M&S’s new recycling bins, including black ready meal trays, crisp packets, sauce sachets and certain cosmetics containers; all of which aren’t currently recycled by local councils and typically end up in landfill. The retailer has pledged to give collected plastic a new life by recycling it into store fittings, furniture and playground equipment for schools. The scheme has initially launched at M&S Tolworth, Cribbs Causeway, Westfield Stratford, Waterside, Loughton, Bluewater, Fosse Park and Peterborough. However, the retailer will roll-out the bins to M&S stores nationwide by the end of 2019, which will be made from recycled plastic collected through the first eight stores. In a bid to extend the reach beyond its customers, M&S will introduce recycling collection points to primary schools across the country in collaboration with waste education social enterprise, Wastebuster, where pupils will be taught about the importance of recycling and reducing plastic waste. M&S senior packaging technologist Laura Fernandez said: “As a business, we’re committed to reducing the amount of plastic we use, and we have already started phasing out non-recyclable packaging from our products. As we continue to work towards our plastic reduction goals, we want to go a step further and help our customers and the next generation to have a real impact on the environment. As part of its plastic plan, M&S will ensure all of its packaging is widely recyclable by 2022, which will see the retailer remove 1,700 tonnes of black plastic packaging by this spring. The take-back initiative follows the launch of a three-month trial at M&S’s Tolworth store, where it has removed plastic packaging from over 90 lines of fruit and veg and introduced greengrocers to the shop floor. M&S has partnered with Dow, a leader in plastics technology, to support the scheme and enable the retailer to give the collected plastic a new purpose.